The sun is out, shining right through our windows. 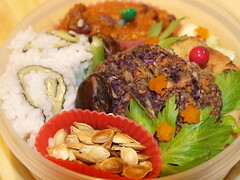 It is the best moment of the year to have a bento for lunch. The best thing is that we can now just walk a little and sit under the shade of a tree in Lacienki park. Yes, I have the chance to work nearby. I believe that every Warsaw inhabitant is proud of this famous park. They can be! It’s a real joy to sit under a tree on a bench and forget for one hour the stress and the work enjoying my lunch. 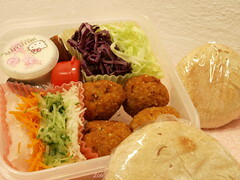 The idea is to prepare the pitas just before eating. The pita are precut and we just had to spread a little nut of humus, then the vegetables, the falafels and top with the white sauce. Bear shared his bento with a colleague on the way to Wroclaw…one more addicted, one more poor wife which has to start bentoing (yes, here female/male roles seems still to be really settled…[hard for a feminist like me 😉] ). 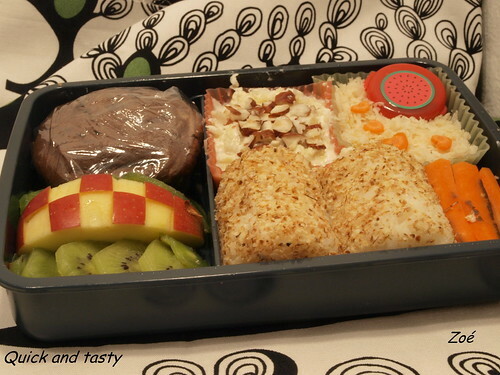 And Bear is begging me to make him this bentos again and again…Pffiou! So in my search of naturally colouring, I was looking for red colouring. And so, I came with a beetroot risotto. 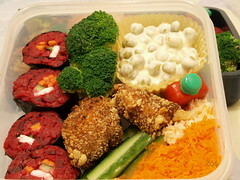 Bear was totally charmed by this combination thanks to the little sweet and sour taste due to the additional vinegar. And this sushi version was incredibly great too. The pea with mayonnaise is one of Bisounours_51’s favourite. But, I have to agree that I cannot agree to put so much of mayonnaise so I just add yoghurt to mayonnaise and some potato starch to thicken it. 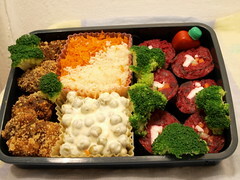 And the last item which was the king of this bento is these tempura cauliflower and broccoli sticks. The tempura paste is flavoured with miso and soya sauce, and breaded with okara. Yes, okara is the rest of grounded soya crumbs which are left-overs from soya milk. To store them if I don’t use them in veggie burgers, I dry them. 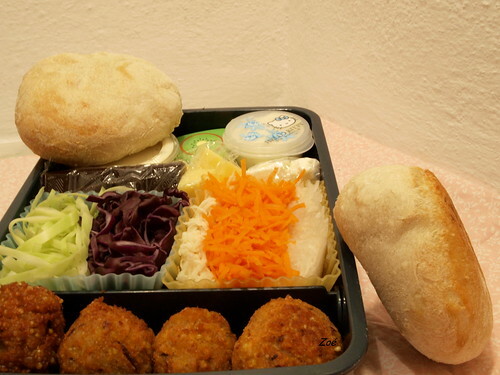 They are a very good item to change from breadcrumbs. Lighter and crispier how could one resist? 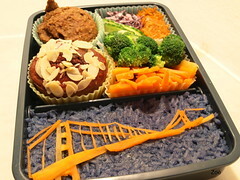 This bento was a true relief and a real pleasure. And as I didn’t manage to choose, you’ll have our both bentos! 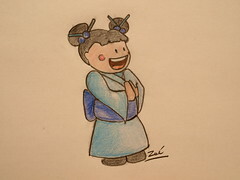 This evening I had a little time. So I tried to answer Sandra‘s question: how to obtain blue natural colouring. The answer is red cabbage with raising powder! The colour is really deep blue. The amount of red cabbage leaves will permit you to play with the intensity of the blue. At first, I was thinking of doing the bridge with nori which would have giving a more precise result, but it didn’t stand out the way carrot did…I’m not at all satisfied with the result but I had truly fun creating it! Hope it’ll be tasty! As I told you, I make my own soya milk, soya yoghurt, silken tofu..Therefore I’m left with okara: the residue of the grounded soya seeds. What could I probably do with it? Veggie burgers definitively! I made a vegan recipe by replacing one egg by 2 tsp of potato starch and 1/4 cup of water. –Banana and apple sweetened curry. That was a real pleasure for the mouth, as vegetables in Chile are so much tastier then in Europe. The ingredients can make such a difference! 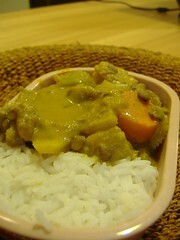 I just enjoyed so much this curry, it’s so tasty. And the banana and apple just adds a sweet touch I love.